Our composite diamond coatings (CDC) are unique, patented technologies for dispersing diamond particulates throughout an autocatalytic nickel alloy matrix. The end result is an extremely conformal, uniform coating that possesses all the physical properties of diamond at a fraction of the cost. Our 1100 Series coatings afford exceptional wear resistance, unrivaled surface hardness, and provide excellent heat transfer properties. Through a proprietary infusion process, we are able to apply and integrate diamond, the hardest known material (10,000 Knoop scale) to most alloy surfaces. Depending on your application needs, we offer a variety of particulate sizes: nano-composites are available for lower precision build requirements while higher growths are also achievable (up to 0.010 inch) to survive the most aggressive wear environments. At Endura Coatings, we offer the Series 1100 Composite Diamond Coatings for dispersing diamond particulates throughout an autocatalytic nickel alloy matrix. Our proprietary infusion process alloys us to apply and integrate diamond to most alloy surfaces for a wide range of applications. Step 3: Composite Diamond Matrix Deposit. Both the size and density of diamond particles can be varied, depending on your surface finish and performance requirements. 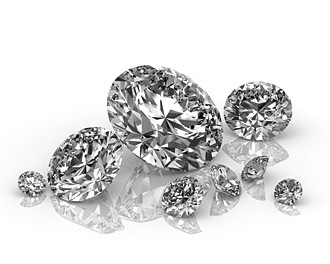 Diamond particles can be engineered as small as 2 microns or as large as 40 microns.